The Festival du Film de Stop Motion de Montréal (Montreal Stop Motion Film Festival) has put out a call for submissions for their 4th edition of the festival. The festival is inviting all stop motion filmmakers from around the world to submit their latest works in any of the three competitive categories: Independent, Academic, and Professional. To celebrate the announcement of their coming festival, they will be presenting a special free screening on Wednesday, April 18th, 2012 at 7:00pm at Concordia University’s J.A. de Sève Theater (1453 Mackay Street, Montreal). The deadline for submissions is September 21, 2012. The 4th Annual Montreal Stop Motion Film Festival will take place from October 19-21. 2012 Call for Entries Officially Open! 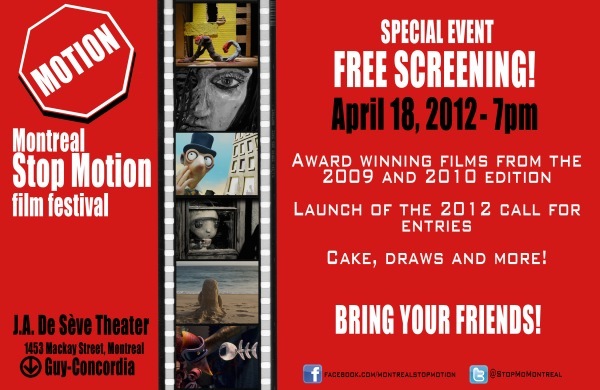 Welcome to the official launch of the 4th edition of the annual Montreal Stop Motion Film Festival. The festival will take place once again in Concordia University’s J.A. de Sève Theater (1453 Mackay Street, Montreal) on October 19th, 20th and the 21st. As the festival ramps up, we will be making further announcements and updates about the upcoming edition via our brand new web site. Be sure to check back often as we will continue to add photos, videos, and other goodies from the previous editions. Our first announcement: We are proud to announce the official opening of our call for entries! Have a look at the new submission section of our website for information concerning eligibility, dates, accepted formats, and new rules. While you’re there, you can also fill out the on-line entry form to submit your film. The submission deadline is September 21, 2012. It’s also easy to stay up-to-date on our latest developments by subscribing to our newsletter, liking us on Facebook, or following us on Twitter. We can’t wait to see you in October for what's sure to be the coolest festival around! Official Opening of the 2012 Call for Entries and a Free Film Screening! 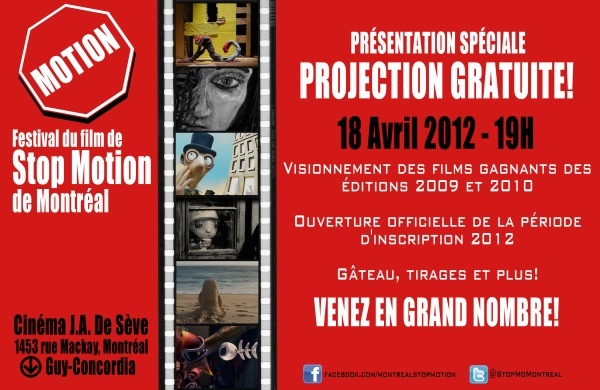 Wednesday March 28, 2012 – The Montreal Stop Motion Film Festival is proud to announce the official opening of its call for entries for the Festival’s fourth edition which will take place on October 19th, 20th and 21st, 2012. In order to celebrate the announcement, we will be presenting a special free screening on Wednesday, April 18th, 2012 at 7:00pm at Concordia University’s J.A. de Sève Theater (1453 Mackay Street, Montreal). We will be presenting award winners from our first and second edition of the festival (2009 and 2010). The new website will be unveiled, there'll be servings of cake and many other surprises during this event. Come and join us to get together and talk about what's surely one of the greatest animation techniques out there.